Pros: Price; solid, lightweight magnesium alloy body; high quality finish and attention to detail; bright, sharp image across almost all of the field of view; excellent contrast, detail and colour rendition; superb strap and high quality accessories; very comfortable to carry and use for extended periods. Cons: Field of view adequate, but for an 8.5x it could be better; some colour fringing (chromatic aberration) visible in very bright, high contrast situations; lime green and silver “detailing” on the body could be a bit gaudy for some tastes. NB: Vanguard is offering a GB£40 (c. €50) mail-in rebate on all Endeavor ED and Spirit ED binoculars purchased between August 2012 and August 2013. Download the Vanguard £40 (c.€50) rebate voucher as a PDF file. Vanguard is better known for its tripods and photographic accessories than for its high quality optics, but this unusual 8.5×45 configuration in the flagship “Endeavor ED” range surprises on all sorts of levels. The binocular packs a lot of high-end features — like ED glass; fully multi-coated optics; phase-corrected, high transmission coatings on the roof prisms and a sturdy, lightweight magnesium alloy housing — into a mid-priced binocular that delivers great optical performance for the price. This binocular feels and performs like a much more expensive instrument. If you’re on a tight budget, and looking to get maximise performance with minimal compromise for your money, then you should check out the Vanguard Endeavor ED. Vanguard has been around since 1986, focusing mainly on tripods, camera bags and other photographic accessories. I didn’t even realise they made their own optics until recently. When I got the opportunity to try out one of the company’s flagship models — the Endeavor ED 8.5×45 I was keen to see how they stacked up. Vanguard Endeavor ED: What’s in the box? The Vanguards arrived in a box that is more an exercise in mass-market branding than the usual under-stated, elegant design exhibited by premium optics brands. It screams about the product features and benefits… as well it might, because at this price point the Endeavor ED is still a mass market product, and there are a lot of premium features to shout about. When you unpack the Vanguard Endeavor ED you’re immediately struck by how solid and well made they feel. I was concerned that the larger than usual 45mm objective lens would result in a binocular that was big, heavy and cumbersome. I needn’t have worried — the Endeavours are comparable in size to other full-size open-bridge designs on the market. The use of magnesium alloy in construction of the body — a feature typically found on very high end binoculars — helps to keep weight down while increasing strength and durability. At 770 grams they Endeavor ED is not the lightest full-size binoculars on the market, but it’s not an overly heavy instrument either, and the ergonomics are very good. When comparing the weight of binoculars it’s important to remember that lighter isn’t always better. A little weight helps the handling — making it easier to steady the binoculars. High quality optical components also tend to be heavier than their inferior counterparts — so beware very lightweight binoculars that often compromise on the quality of components. The moulded rubber armouring covers every surface of the Endeavor ED bar the twin hinges that are finished in a matt metallic silver. It is very tactile, yielding and comfortable to hold, while the textured surface and well placed thumb indents on the underside make for a secure grip whatever the conditions. The Endeavor ED is a lovely binocular to carry and use, so much so that it really challenges my long-held prejudice against the popular open-bridge design. Top marks to Vanguard. The silver finish on the hinges, along with the lime green rings around the base of each eyepiece, make the Endeavor a very distinctive looking binocular — but are possibly not to everyone’s taste. Wildlife observation in particular tends to be about subdued colours and blending in. 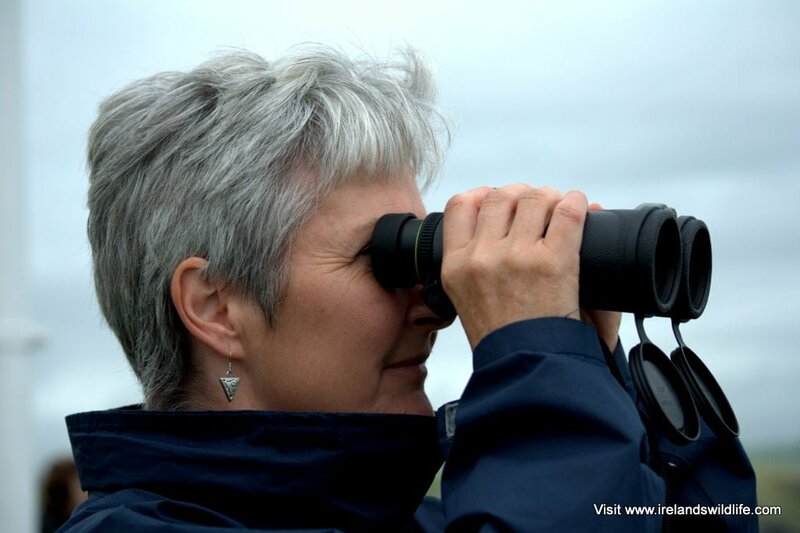 There’s a reason why practically every wildlife watching binocular you see is black or dull green. Vanguard has made a very distinctive binocular — no doubt about it — but the reaction from most birders and nature enthusiasts I showed them too was “nice bins… shame about the gaudy bits”. Conversely when I showed them to non-wildlife people they really liked the distinctive contemporary design. The Endeavor ED comes with the usual assortment of accessories: a padded neoprene strap, eyepiece rainguard, tethered objective lens covers, a cordura style carry case and a cleaning cloth. The strap is excellent. 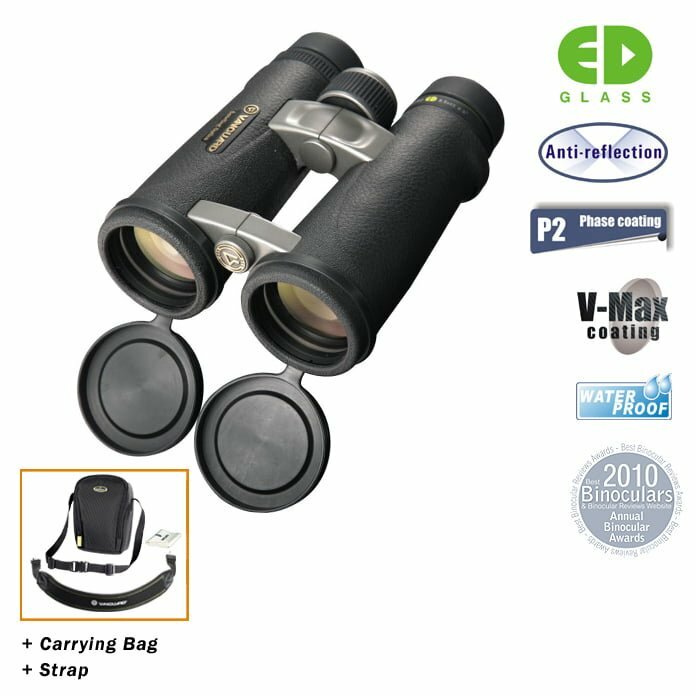 It’s as padded, wide and comfortable as any binocular strap I’ve ever used, and makes carrying the binoculars effortless. Interestingly it comes with quick-release buckles that allow you to detach it from the binocular as required, and similar buckles on the case let you attach the same comfortable strap to that when you’re using it to carry your optics. Initially I thought this was a great feature, but I never actually used it during the review period. For me at least, once a strap is on my binoculars it stays on my binoculars. My one gripe with the strap is that it’s a bit too long. I like my binoculars to sit on my chest rather than swing around my belly, but I couldn’t make the Vanguard strap short enough to achieve that. It’s a small niggle: the strap is really comfortable, and I soon got used to it. The eyepiece rainguard and tethered objective covers are pretty standard fare — they work very well and fit securely to the binoculars. The finish and quality of materials feels a little better than you usually find with binoculars in this price range. The black cordura-style case is very distinctive, with the same lime-green detailing as the binocular. It is surprisingly sleek-looking for a full size binocular case. The Endeavor ED fits into it snugly, and the quick release buckles make it easy to detach the strap from the binoculars and re-attach it to the case for transport if that’s what you want. Interestingly the left and right buckles on the case will slot into each other to form a neat little “carrying handle”. The buckles on the binocular do the same — although quite why you’d want to do that is beyond me. Lastly, the cleaning cloth is top-notch — much better quality than you often get with binoculars that are a lot more expensive… a tiny detail perhaps, but a welcome one. Overall the Vanguard accessories are of a high quality and show an attention to detail that’s often lacking at this sort of price. Accessories are a relatively small part of the overall package when it comes to optics… but they do add significantly to the feeling of quality and value you get when you unpack your purchase — so hat’s off to Vanguard for getting this right. The first impression of a solid binocular that’s really comfortable to carry, hold and use endures when you take the Endeavor ED into the field. I used the Vanguards extensively for a number of weeks and never once got tired of holding or carrying them around. This isn’t a small binocular, but it doesn’t feel in anyway bulky or oversized either. It is the most comfortable open bridge design I’ve tested to date. The Endeavor is a joy to use. The armouring, as I’ve already mentioned, is very tactile. It’s yielding enough to offer a comfortable grip without feeling overly spongy and it does a good job of cushioning the binocular from the occasional knock, although you get the feeling that the Endeavor is solid enough to bounce back from anything you could throw at it with or without its rubber armour. The twist-up eye-cups offer a huge 19mm of eye relief, and have four possible settings — fully down, fully up and two intermediate stops — in theory that means they should work flawlessly, offering a full field of view to practically all users, with or without glasses. There are exceptions however. Very long eye-relief is great for lots of people… but it can cause problems with occasional blackouts when panning for some people. I had no issues using the Endeavor ED without glasses and with the eyepiece in the fully up position. Most people with glasses should get on perfectly well with the Endeavor ED with the eyepieces in the fully down position or set at one of the intermediate stops. In practice setting the right eye-relief can be a very personal thing, and one friend with glasses who I showed the Endeavor’s to struggled to get the full field of view without experiencing some blackouts while using them. 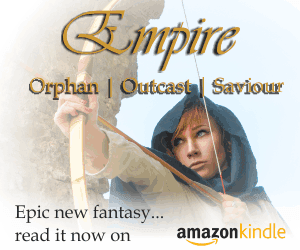 The ideal setting for him, with his current pair of glasses, seemed to fall somewhere between the fully down and first intermediate stop of the eye-cups. This is a very personal thing, and is not really a criticism of the Endeavor ED — it’s just something to bear in mind with any long-eye-relief binocular. Focusing on the Vanguard Endeavor ED is incredibly quick. The mechanism takes you from a close focus of around 2.5m (just over 8feet) to infinity in just 3/4 of an anti-clockwise turn. Quick focus can be something of a double-edged sword. It lets you switch very quickly from watching something practically at your feet, to scanning the horizon. That’s invaluable when a distant bird suddenly takes wing, but it can make fine-tuning your focus a little tricky. Because even a slight turn of the wheel moves the focus plane substantially it’s easy to overshoot your focus point, forcing you to dial back and forth to get a pin-sharp image. While I did have some issues with overshooting focus initially, I soon got the hang of it, and had no problem achieving clear, sharp focus on whatever I pointed the Vanguards at. The focus wheel itself is metal with a ribbed rubber central track that offers excellent grip, and like the binocular itself is a joy to use. It is large and turns very smoothly with a comfortable amount of resistance and I couldn’t detect any “play” in the mechanism. A close focus of 2.5 metres should be fine in most instances, but it does fall a little short of the very best full-size binoculars out there. If you do a lot of butterfly or dragonfly watching at close quarters it may be an issue for you — but for most birders and wildlife enthusiasts 2.5 metres will work just fine. The dioptre adjustment that lets you compensate for differences in visual acuity between your eyes is situated in the familiar location below the right-hand eyepiece. It has a locking mechanism to prevent accidental alteration — simply lift the ring to unlock, turn to set, then slide it back down to lock in position. It’s simple, effective and I experienced no issues with the dioptre setting changing during the review period. So, the Endeavour ED is a robust, comfortable binocular that feels and handles like a very high quality instrument — but how does it perform optically? In short — very well indeed. The view through the endeavour ED is very bright, sharp and detailed with excellent contrast and good edge sharpness and colour rendition. The central sweet spot is large, and extends well out towards the edge of the field of view. The Endeavor ED is fully multi-coated on all air-to-glass surfaces and uses Vanguard’s proprietary “P2” phase correction and “VMax” high transmission coatings on high quality BAK4 glass prisms to improve light transmission and resolution. When paired with ED glass in the larger-than-usual objective lenses and special “anti-glare” coatings on all external lens surfaces the result is an impressively bright, high resolution view. The extra few millimetres in the objective lens, and the correspondingly larger exit pupil really come into their own as light falls — with brightness falling off less rapidly than comparable 42 mm binoculars. The coatings and quality of the optical components deliver outstanding quality across a wide range of conditions from early morning well into the evening with cloud, rain or shine. I found myself really enjoying the extra brightness afforded by the unusual 8.5×45 configuration, particularly looking into shadowy hedgerows on dull Irish summer days, when the Vanguards pulled in plenty of detail from the murkier parts of the vegetation. They’re not as good as the best I’ve seen — but for the price the performance is very impressive indeed. Colours are fairly neutral and well balanced, with good contrast and perhaps a very slight warm/yellow bias — but only if you really look hard for it, and certainly nothing significant enough to impact the enjoyment of using the Endeavour ED in the field. Chromatic aberration is reasonably well controlled in the Vanguard Endeavour ED — although perhaps not to the degree I’d normally expect with an “ED” binocular. One of the main features of “ED” (Extra Low Dispersion) glass in optical systems is to reduce the affect of “colour fringing” (chromatic aberration) around high contrast edges in the field of view. In normal conditions, and when using the Endeavour ED on its own I rarely noticed it — but in very bright conditions when looking at high contrast subjects (a telegraph pole silhouetted against a white cloud, for example) I could make out a bright green “halo” along the edges — an effect that got progressively worse as I moved the subject out towards the edge of the field. In normal use it’s not much of an issue, and I hardly ever noticed distracting colour fringing in the centre of the frame — but occasionally I would detect it in the periphery of my vision. It’s not particularly bad, but it was surprising in a binocular sporting ED glass, and does detract from what is an otherwise excellent viewing experience all around. The field of view of the Vanguard Endeavor ED 8.5×45 is 6.5 degrees or 114m/1000m. That’s reasonably good — but not outstanding for an 8.5x — it’s nearer to the field of view of an exceptional 10×42 binocular than it is to a good 8×42. In practice I found the field of view fine. Good edge sharpness helped the view through the Vanguards to feel unconstrained and quite expansive. It’s nowhere near the “walk-in and look around” view you get with some alpha binoculars, but it’s perfectly usable and functional. The Vanguard Endeavour ED is fully waterproofed and nitrogen filled to prevent both internal fogging and ingress of the elements — both water and dust / debris. I had no issues with fogging or water ingress testing in some fairly extreme Irish summer weather. The binoculars (and me) regularly got soaked, but continued to perform well across a very wide range of environmental conditions. I didn’t go as far as the US tester who submerged the Endeavor ED’s little brother, the Vanguard Spirit ED, in water, froze it solid, and thawed it out in a 2-day downpour. The binocular emerged unscathed… and in theory the Endeavour ED should stand up to the same sort of rough treatment. Not that I suggest you try it with your own optics, of course. Vanguard offer a limited lifetime warranty on their Endeavour ED range, covering defect in materials or workmanship for the life of the original owner. 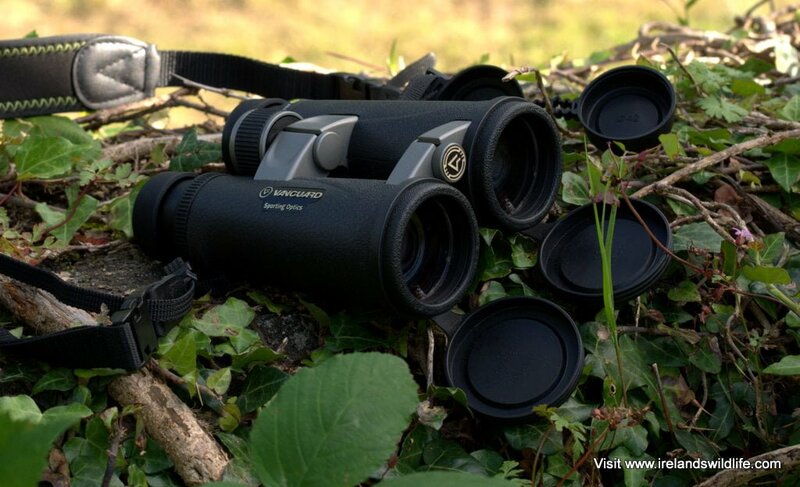 The Vanguard Endeavor ED is a very impressive all-round binocular for the price. The high quality finish, top-end components, great accessories and attention to detail result in a binocular that, in almost every respect, punches well above its weight in this price range. If Vanguard could address the slight chromatic aberration issue in extreme contrast situations, and perhaps squeeze a slightly wider field of view out of the optical system without sacrificing image quality, then they’d have a really outstanding set of optics on their hands. As it is the Vanguard Endeavor ED is a very accomplished piece of kit that is such a joy to use that I found myself reaching for it again and again in preference to several more expensive review models sitting alongside it. That, I think, tells its own story. 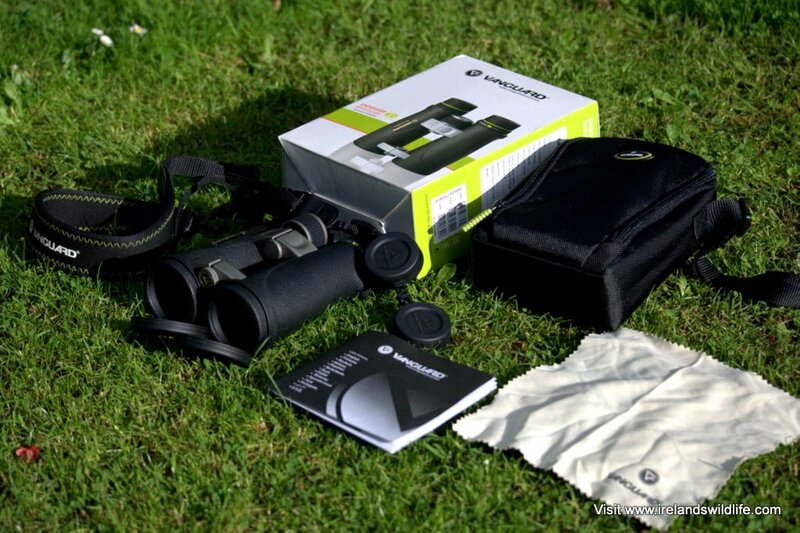 If you’re on a tight budget, and are looking for a high performance wildlife watching or birding binocular that delivers superb performance, and can cope with everything the Irish climate can throw at it, you should take a look at the Vanguard Endeavor ED — it really is a whole lot of binocular for the money. Thanks Calvin – most accurate review of the 8.5/45 i’ve read, and the only one that mentions much about the CA. I’ve had a pair for two years and have found them great in almost all circumstances. For me, the CA seems most obvious in ‘bright grey’ conditions, but – as most birders aren’t concentrating on the edges, but the centre – it’s never been much of a problem. Ergonomically great bins with clarity of view that is only beaten by optics costing 5 times more. Hi Paddy — glad to hear you’re enjoying your Vanguard binoculars… they really are very impressive, and offer tremendous value for money. Yes… the CA is there if you look hard for it… but in general use it’s not noticeable. and certainly doesn’t detract from the enjoyment of using what are an excellent pair of binoculars. Vanguard is a manufacturer that’s obviously investing significantly in refining their optics line… they’re about to bring their new HD scope to market — I’m expecting one for review any day now. It’s great to see such high quality optics at a price point that makes them affordable to more people. They aren’t in the same ball park as the Swaro, Leica, Zeiss brigade… yet… but Vanguard, and other manufacturers like Vortex and Hawke, certainly seem to be narrowing the gap. I spoke to the Vanguard chaps at the BirdFair in August: there apparently are plans for further developments at the high end of the range for release in 2014. If they address the CA and the field, they’re going to have a classic. On a bird trip to Bulgaria, i swapped the Vanguards for a mate’s Swaros (oldish) for a morning. After a couple of hours i was waiting to get them back….suppose it’s what you get used to, but the ‘feel’ of them are great. Thanks for stopping by. I’m glad you found the review useful. I’m not familiar with the Nikon Monarch (yet, very happy to review it if anyone from Nikon happens to read this), but I do know that the Vanguard Endeavor ED, in all its guises, is an excellent binocular for the money — particularly when you take discounts and cashback offers into account. I know a few people who’ve bought them, and have yet to meet anyone who isn’t delighted with their purchase. Best of luck, whichever binocular you choose.